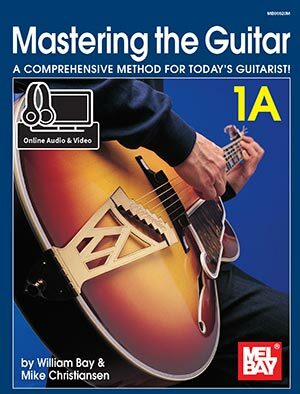 Mastering the Guitar is an innovative, exciting new way to learn the guitar. Co-authored by William Bay and Michael Christiansen, this extremely comprehensive method applies the internationally acclaimed Mel Bay teaching concept to the vast array of musical styles and techniques found in today's music. Written in notation and tablature, it covers guitar solo and accompaniment styles ranging from Celtic to Classic to Cajun; from Flamenco to fiddle tunes to rock; from Baroque to blues to bluegrass; and from Latin to jazz to Reggae. A special feature of this method is that it teaches both flatpicking and fingerstyle solo and accompaniment techniques. The two books in level 1 present essential foundational studies for contemporary guitar performance. Book 1A covers the keys of C, Am, G, and Em in great depth, presenting over 155 solos and duets and more than 140 scale and picking studies, chord etudes, and accompaniment pieces. Book 1B covers the keys of D, A, E, F, Dm and Bf. In addition, Book 1B has over 130 solos and duets and over 40 comprehensive scale and picking studies. Numerous chord progression studies and chord accompaniment pieces and etudes are also included. A Technique Studies book is available which will bring an added level of flatpicking and fingerpicking excellence to each key presented in Book 1A and Book 1B. The advanced levels of this method introduce a creative and unique approach to learning and mastering the higher positions on the guitar fingerboard. We feel that Mastering the Guitar is the most comprehensive approach to guitar technique, repertoire, and performance to be found anywhere. Audio and video downloads available online.